Globally, black people are among the most influential trendsetters in music and fashion. Like music and other forms of black cultural production, personal style and fashion are forms of expression and creativity that are often politically charged. An intergenerational panel, representing a wide range of fields including academia, fashion, art, and social justice, will engage with the idea of personal style to interrogate constructions of black masculinity, investigate ideas of male identity in the contemporary landscape, and consider black male resistance in a discussion about what it means to represent oneself visually. The panel will include Ryann Holmes, Bayete Ross Smith, and Masud “Mikeflo” Asante, and be moderated by Monica L. Miller. The discussion will be preceded by a red carpet-style event-- come ready to stunt and stay for the thoughtful conversation! Masud "Mikeflo" Asante is a recording artist, DJ, producer, consultant, stylist, and "freshmaker." He currently records as half of the duo ROYAL (alongside bandmate Devon Lee) and is the official tour DJ for hip hop legends 'Dead Prez'. Mikeflo's career has taken him all over the world, but after many moons in Atlanta, this Chicago native now resides in Brooklyn, NY. Aside from his travels with both ROYAL and Dead Prez, Mikeflo can be found taking his various DJ series' and concept parties to a city near you. Follow him on Instagram and Twtter @mikefloRBG. Ryann Holmes has worked in every industry from retail to philanthropy, but found most happiness when creating cool things with talented friends. Ryann also found joy and magic in being a part of queer, black culture in Brooklyn. In 2009, Ryann founded the bklyn boihood collective. As of today the collective has grown to five core members, based in Detroit, Miami, and Brooklyn, over 50,000 online followers, 6 calendars, annual parties, monthly gatherings, and a published anthology called Outside the XY. Ryann was the Director of Community Programs at the Museum of Contemporary African Diaspora Arts (MoCADA), from 2012-2015, and produced the Soul of BK Festival, co-created over 100 arts programs with the Fort Greene’s housing projects community, and co-managed KidFlix, Bed Stuy’s only film festival for children of color. In 2016, Ryann was voted one of Brooklyn Magazine’s top 100 cultural innovators. Ryann is also the co-founder of Lucid Haus records, an indie music label based in Brooklyn, featuring artists like Nappy Nina, Theo Mode, & Ria Boss. He was also a music supervisor for 195 Lewis, a boundary breaking web series that explores the lives of queer women of color in Brooklyn, New York, and which has aired on BRIC TV. Ryann has an MBA from Baruch College in Social Entrepreneurship. Monica L. Miller is the Tow Family Associate Professor of English and Africana Studies at Barnard College. She is the author of Slaves to Fashion: Black Dandyism and the Styling of Black Diasporic Identity, which received the 2010 William Sanders Scarborough Prize for the best book in African American literature and culture from the Modern Language Association and was shortlisted for the 2010 Modernist Studies Association book prize. A grantee from the Andrew W. Mellon Foundation (2012, 2001), the Schomburg Center for Research in Black Culture (2004), and the Woodrow Wilson National Fellowship Foundation (2004), she is a specialist in contemporary African American and Afro-diasporic literature and cultural studies. She is currently at work on a new project, Blackness Swedish Style: Race, Diaspora, and Belonging, which considers cultural production by the emerging black community in Sweden and its connection to black European identity formation and cultural/political movements. Bayeté Ross Smith is a photographer, multi-media artist, filmmaker, and educator living in New York City. He has exhibited internationally with the San Francisco Arts Commission, the Brooklyn Museum, the Oakland Museum of California, TEDx MidAtlantic, Duetsche Bank, Rush Arts Gallery, BRIC, the Phillips Collection, and Jack Shainman Gallery, among others. His collaborative projects Along The Way and Question Bridge: Black Males have shown at the 2008 and 2012 Sundance Film Festival, respectively. In addition to his fine art practice Bayeté is currently the Associate Program Director for the Kings against Violence Initiative (KAVI), a hospital and school based violence prevention non-profit organization in New York that partners with Kings County Hospital. He has also taught at the International Center of Photography, New York University's Tisch School of the Arts, Parsons, the New School for Design, the California College of the Arts. 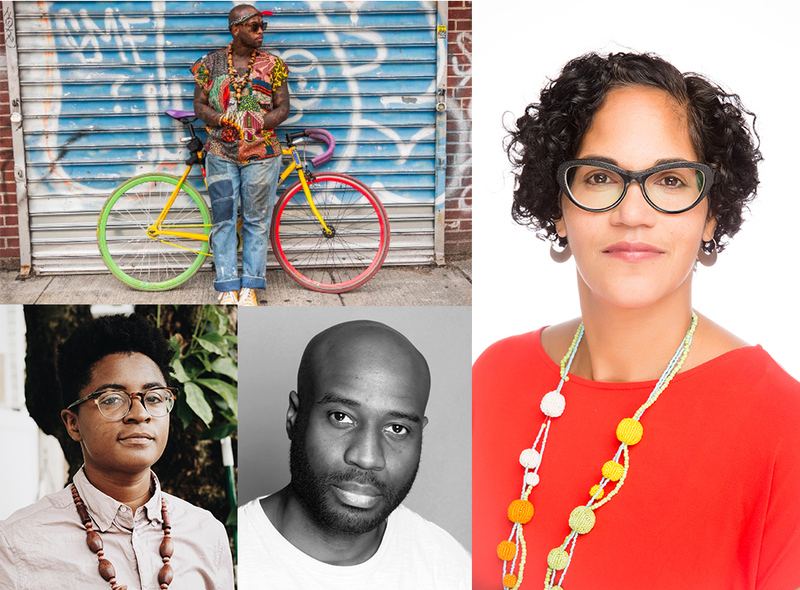 BRIC’s Stoop Series welcomes you in for dynamic conversations that connect art, performance, media and other creative fields with big ideas that are important to Brooklynites. The Stoop Series highlights voices we don’t hear enough, creative solutions that deserve more attention, artistic endeavors that make you see the world differently and tools for enhancing your own creativity. Join us on the Stoop -- there’s something different every week!